The trouble with Canadian authors is identical to the trouble with Canadian artists in general: They invest so much time and effort into "being Canadian" that, for the most part, they tend to produce art that has absolutely no appeal to non-Canadian audiences. So it goes with the many Canadian writers out there: Margaret Atwood, Graham Greene, and of course the quintessential Canadian author, Lucy M. Montgomery of Anne of Green Gables fame. What all these writers have in common is a propensity to write folksy novels about the Canadian experience. On its face, there isn't anything wrong with this. Canada is a nation of some 33 million people. The geography of the country has made for a hard, "frontiersy" life over the past 300 years and beyond. The deep-rooted British Loyalist culture has also made for a remarkable political environment in the country, too, replacing the more American attributes of individualism and competitiveness with a more European-flavored preference for communal collectivism. This is the real difference between the two otherwise very similar countries; this is the attribute that Americans so often misdiagnose as "friendliness" among their Canadian neighbors, and that which leads the Canadians to view Americans as "self-absorbed." So it is with Yann Martel, whose 2001 novel Life of Pi stunned the world with its surreal story of a young boy adrift at sea aboard a life boat co-occupied with a Bengal tiger. The novel was an enormous best-seller that rocketed Martel to as close to international super-stardom as an author gets. Not bad for a novel that was initially rejected by at least five major publishing companies. The fame of novel renders a plot synopsis extraneous in this case. 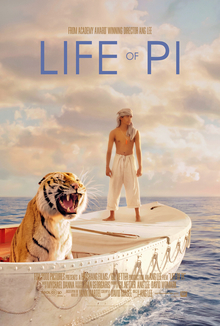 On the one hand, if you haven't already read Life of Pi, you've been living under a rock for the past ten years. On the other hand, the story is incredibly unique, and has a major, major plot twist; providing any kind of in-depth plot synopsis of a story like this would give away more than I think ought to be given away. You'll just have to read the book or see the movie for yourself. What I can say is that this is easily one of the best books of the past 30 years or more. The story is emotionally powerful and employs a mature, literary sense of symbolism not typically found in novels written after the first couple of decades of the 20th Century. When you get right down to it, Life of Pi the movie manages to accomplish everything that the novel did, as far as story-telling goes. The movie does not appear to have done as well as the book, and we can speculate as to why that may be. For my money, it was a surprisingly excellent movie, and I highly recommend it to all.